Summer's Over in Tift County?! The calendar may claim that it's officially summer until late September but public school opens Thursday, Aug. 8 in Tift County, ending summer vacation for students. Tiftarea Academy's first day for students is Aug. 22. On Saturday, Aug. 3, local folks are gathering for the fourth consecutive year for "Prayer for our Schools" from 9:30 to 10 a.m.
Local churches and officials are gathering at each school in the county "to ask for God's continued protection of our children, provision in every area of need and productivity for students, faculty and staff during the 2013-2014 school year," said the Rev. L.C. Solomon, pastor of Beulah Hill Baptist Church. Also this coming week, kindergarten registration in Tift County will be on Monday, Aug. 5 from 1- 4 p.m. at Annie Belle Clark Primary, G.O. Bailey Primary, Len Lastinger Primary, Northside Primary and Omega School. Kindergarten registrants need an immunization form; certified birth certificate; eye, ear & dental form; the child's Social Security card; and proof of residence. At its annual "Kickoff to Men's Health" event, Tift Regional Medical Center brings together seven area high school football coaches to meet with the public and discuss the 2013 season starting in a few weeks. As the school year begins in Tifton, it is time to "Stuff the Bus" full of school supplies. 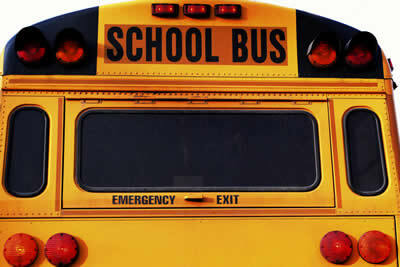 Between Aug. 5 and Aug. 12, a Tift County school bus will be parked in front of Publix supermarket on Virginia Avenue. School supplies may be purchased at any retailer and donated to the United Way of South Central Georgia so that the organization "can stuff that bus to the roof and have donations falling out of the windows!" says Greg Millette, United Way's executive director. From 2 to 6 p.m. weekdays, donors may drop off supplies to volunteers at the bus. Folks donating during these hours will receive giveaways and be entered into a daily prize drawing. School supply donations may also be dropped off at the Publix customer service desk. And Publix shoppers have the option of simply adding a donation of $5, $7 or $10 to their grocery purchase to provide school supplies for children. "Take advantage of the great sales and the upcoming tax-free weekend (Aug. 9-10) to help us 'Stuff the Bus' so that a lack of school supplies doesn't create a barrier to educational success for our children in need," Millette says. Jump into a 1960's time machine and rock to the tunes of Elvis, the Beach Boys, the Beatles and the Doors during a retro supper dance at the Tifton Elks Club, 7 p.m., Saturday, Aug. 24. The Literacy Volunteers of Tifton-Tift County hosts a Varsity Reunion to remember the iconic Tifton drive-in restaurant that figures prominently in the memories of Tifton's Baby Boomers. "We are planning this event to be fun and affordable," said Kay Ellis, Varsity Reunion chairman. "The cost is $20 a person, and that will buy all the hamburgers, hotdogs, and french fries you can eat. In addition, the admission price will give you access to an ice cream bar where you can dress your frozen treats with sundae toppings and and a cola bar complete with vanilla and cherry syrup." The Elks Club will also provide a cash bar. "We are especially excited about the live music that we will be presenting," said Dr. Charles Posey, Literacy Volunteers director. Ed Branch has put together an ensemble, "Eddie and the Rockets," composed of "Dangerous" Don Dove on vocals and harmonica, Derrick Dove on vocals and lead guitar, Don Hill on bass guitar and Eddie "Rocket" Branch on drums. Prizes will be awarded for best costumes reminiscent of 1960s and '70s fashion, and there will be a dance contest in the categories of rock n roll, twist, disco swing and the hustle. Literacy Volunteers is a non-profit organization promoting literacy and sponsors tutoring, small classes and book collections, helping adults earn high school diplomas and pass the GED test. For information call 229-392-0505. Tickets available online: Click Here!. "She Drives Me Out of My Mind"
Save the Date! Tickets will be available soon to the General Public! Interns Spend Summer Around U.S.
Student interns from Abraham Baldwin Agricultural College covered the country this summer from Maine to Montana getting a step up on careers ranging from beekeeping to blueberries. Dr. Tim Marshall, dean of the School of Agriculture and Natural Resources, can't wait to hear about student adventures when classes begin Aug. 14.
which ABAC uses as a learning laboratory. "We want to make sure every student that graduates from our program is a valuable resource for the employer," Marshall said. "Internships are a big part of that." During the 2012 fall term, ABAC attracted students from 25 countries, 22 states, and 151 of Georgia's 159 counties. Some of the students returned to their home states for internships while others sought new venues to expand their knowledge. "We had around 100 students interning from the School of Agriculture and Natural Resources all the way from Montana to South Texas to New England down to South Florida," Marshall said. "They were working on everything from golf courses to citrus, from beekeeping to blueberries, and a lot of them were working in agribusinesses." Marshall said some of the students later get full-time employment because of the positive impressions they made as interns. ABAC's enrollment is expected to surpass 3,000 students this term. About 1,000 will be enrolled in the School of Agriculture and Natural Resources. Prayer for Our Schools, 9:30 a.m., all Tift County public schools. Joe Courson -- writer, TV journalist, educator -- left us this week, and our lives will now be a little dimmer. We will miss his joyful smile, his quick wit, his incessant curiosity, but probably, most of all, his kindness and sincerity. I've known Joe for a dozen years through our Tifton Rotary Club and when he wrote an occasional column for me to print in The Tifton Gazette. We became friends -- brothers in journalism -- and I talked with him even more during the past year as I transitioned from print journalism to online and video news. He was dealing with his own health challenges but still took time to offer me advice and encouragement. He sent me numerous emails with links to video tutorials. He was quick to send a short message when he liked something that I had published or videotaped. His comments were sincere, and they were appreciated. My relationship with Joe was not unique, as he did this with many people. He cared about others, and he took the extra time to give a pat on the back and to offer a few words of encouragement. I will miss him and will try to live up to his example, as he so well personified our Rotary International motto: "Service above self."